LTHForum.com - Indianapolis - Plump's Last Shot pork tenderloin OMG! Indianapolis - Plump's Last Shot pork tenderloin OMG! LTH Home > Chat > Beyond Chicagoland > Indianapolis - Plump's Last Shot pork tenderloin OMG! BF and I were in Indy to visit the folks over the holiday. In between a driving tour of famous (the Speedway, Hinkle Fieldhouse, Conseco Fieldhouse and the Art Museum) and not-so famous (my HS) landmarks, we decided to hit up Broad Ripple for a stroll, a few beers, some grub and catching up on some college football. We took a break from the usual suspects on Broad Ripple ave and thereabouts and wandered down by the Monon Trail. We happened upon Plump's Last Shot, housed in a ramshackle little bungalow. I noted to BF that Bobby Plump, the proprietor, had played on the Milan team on which Hoosiers was based. He wanted to go in for a brew and see what there was to eat. I was game. It was dark and sleepy in there with a few of what appeared to be locals - of the non-RCG vareity, as the Ripple is teeming with them. Food was on a chalkboard. I went for the pulled pork sandwich and BF had the pork tenderloin sandwich. Man on man! They do it up right in Indy. Giant pork tenderloin pounded into thin perfection, battered and deep fried. The breading was golden and crisp - no hint of greasiness. And it was hot. Which was perfect. I kept tearing little hunks off BF's sandwich, as those of you in the know are aware...PT's are much larger than the rolls on which they are served. The pulled pork was fine - but I was suffering from some massive 'Man! I wish I'd ordered what he did!'. Topped off with some HOT and nicely seasoned crinkle fries and two chilly brews...delicious. If you ever find yourself in Indy, specifically Broad Ripple, and are looking for a bit of Hoosier history and a darn good tenderloin sandwich, head to Plump's. and I hadn't a reason to return since. give their Bluegill Dinner a try. Something seems up with your formatting. However, it's making for some rather poignant poetry. greygardens wrote: We happened upon Plump's Last Shot, housed in a ramshackle little bungalow. I noted to BF that Bobby Plump, the proprietor, had played on the Milan team on which Hoosiers was based. The timing of this post could not have been better for me. I wanted a pork tenderloin and I had planned on being in Broad Ripple on Wednesday anyway. Ordinarily I hate sports bars but Plump's Last Shot is anything but a typical sports bar. One minor correction—the place is owned by Bobby's son Jonathan but reportedly Bobby stops in frequently. 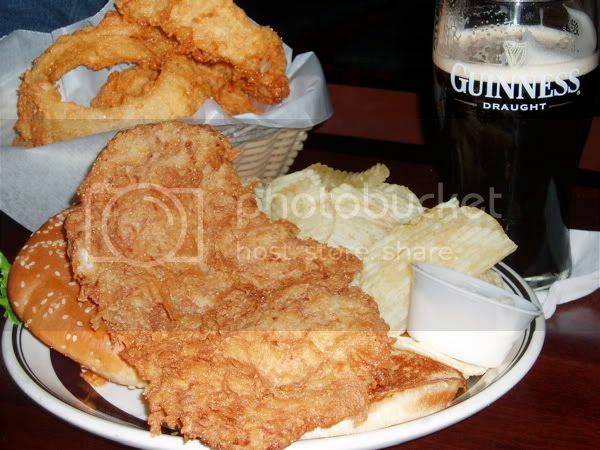 greygardens wrote: Giant pork tenderloin pounded into thin perfection, battered and deep fried. The breading was golden and crisp - no hint of greasiness. It was a good one alright. Thanks again for the suggestion. Great photo...seriously. Now I'm hungry. I had to share, so that someone not well versed is in Indy with his or her heart set on a pork tenderloin sandwich heeded my prior recommendation...Was in Indy again visiting the folks. BF and I headed to Broad Ripple to grab a quick pork tenderloin sandwich at Plump's. BF had been clammoring for one since we left Indy the last time we were there he loved it so much. Denied. We walked in at 12:30. The place was drowsy and occupied with a few people who seemed to be friends of the bar staff. We asked where to sit for lunch after being ignored for a couple of minutes. And told, "Kitchen's closed." No explanation, nothing. Which is certainly a small, casual place's perogative, but it was said so rudely. I didn't understand. What had I done?! I don't have three heads, nor was I brandishing an axe. I'm not a particularly sensitive person...I don't expect a queen's treatment at a bar or the staff to be my best friend, but this bordered on hostile. BF and I journeyed further north to downtown Carmel. They've redone that section nicely. We headed to Muldoon's on Main Street, which is somewhere I remembered the folks heading to for PT sandwiches when I was younger. Friendly efficient staff. Typical sports type pub with a lot of families eating lunch in addition to young couples and groups of friends. The sandwich there was every bit as delicious as the one (as I remembered it) at Plump's, served with a friendly smile. Crisp, golden breading on succulent tenderloin pounded thin with a nice tomato and lettuce garnish. They even have a smaller version of the sandwich (not that I needed it...). I felt much better that I was able to get BF his desired sandwich with a side of hoosier hospitality. Here is your Muldoon's tenderloin. Enjoy!